Private Bass Guitar tutoring lessons Anaheim, CA. Check out some of our most popular teachers near Anaheim, CA including Los Angeles, Long Beach, Irvine, Glendale and Burbank. I have been teaching the bass for about 20 years. My intention is to teach the student his/her role as a bass player, starting with the foundation of locking in with the drummer while supporting the harmony and melody. Knowledge of the notes on the fret board is essential, as well as the basics of theory (understanding of music). As a guitarist, I can teach you songs and jam with you so you can get hands on experience of what is like to learn from a bassist and...jam with a guitarist! Learning an instrument should be fun as well as informative. I'm serious and passionate about my students learning their instrument and becoming great musicians, however, I also want it to be an enjoyable process. You should look forward to your lessons but know I'm going to expect you to practice as well. I use a combination of my own curriculum and books that are based on the fundamentals of music. We can learn to read tablature or read traditional music. A excellent way to pick music at a quick pace is by learning songs in the style you like, while learning about the keys, scales, arpeggios, and chord construction once you're able to play some songs. After 3 or 6 months you will be playing a basic repertoire of songs that interest you while continuing to progress at a steady pace in the understanding of music. North County Rehearsal Studio is a rehearsal hall with private lesson room, we have the amps to plug into and audio equipment so we can listen and learn from the music YOU like!!! I can also come to YOUR house if the rehearsal located in Brea is too far. I expect my students to have a guitar or bass so they can practice at home with. I could bring or provide a small practice amp and a music stand and some study materials. I teach in Orange County and I live in L.A County so If I need to come to your house I can cover a big area. During the course of my 20 plus years of teaching, I have had to teach individuals of all levels. I have had to teach little girls Hanna Montana, and blue collar workers--Eric Clapton. Styles include, Rock, Pop, Metal, Jazz, Rockabilly, Country, Spanish, Beginning Classical and ETC! Tony is awesome! After 3 years, he does not fail to interest my daughter and challenger her more to improve her music. Tony is amazing. He has a great background of music theory and talent. My daughter has learned so much with Tony after nearly 2-years of instruction. I am 20, and I have been taking lessons with tony for almost 4 month. He really is a great teacher. He really makes guitar easy to learn and always give you confidence about learning new things. He is cool and nice, able to get you through all kinds of difficulties of learning guitar. Give hime a shot, if you really want to play guitar. He is better than any Youtube or on-line stuff. I teach all levels of bass guitar, from beginning to advanced. I teach in many genres of music including jazz, rock, blues, pop, folk, funk/slap bass, r&b and country music. I cater my lessons to the individual students wants and needs. In other words, I will teach you what YOU want to learn! I am great with kids and have received excellent feedback about my teaching style. I play 5 instruments and teach guitar, ukulele, and bass. With each lesson you will find a fun and easy to understand way to improve your playing tailored just for you. No internet video can do that. Simply choose this plan and select the amount of time you would like to work with me. I would suggest messaging me before you schedule, so that I can figure out the best plan for you. Hello future rockstars! Now is the time for you to unlock your potential and take your interest in the guitar to the next level. 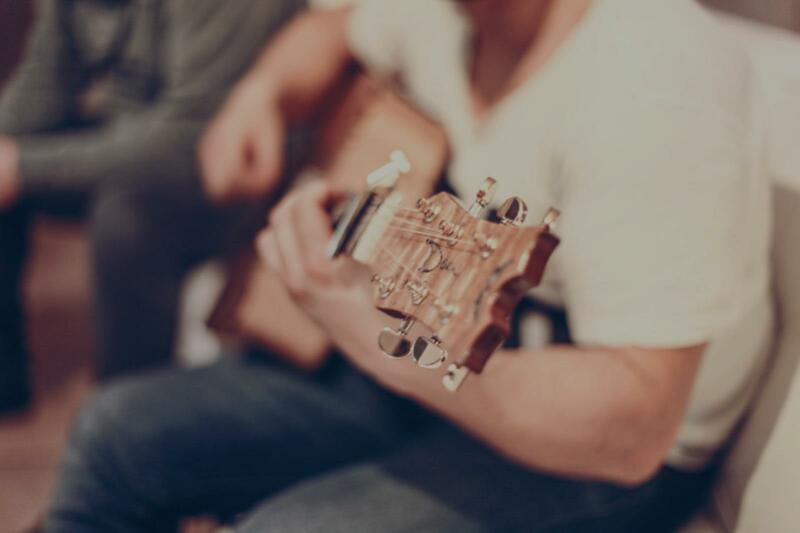 Whether it is for a future career, a hobby, or just to be able to play a song for your friends, I can develop a personalized plan to get you the results you desire. refore have acquired a strong attention to detail and solid work ethic to achieve my desired results. I believe in creating a positive and exciting work environment where we can have you develop at your own pace in a productive way. A great teacher is one that customizes their lesson to fit the student's individual needs while making the lesson educational and fun! Being that I am one of the younger guitar teachers out there, I am able to better relate to younger students on a more personal level and possess an energetic teaching style and willingness to better myself as a teacher and musician just as much as my student. Still have some questions before you try a first lesson? I am available to answer your questions! Just message me through this website and I will respond within only a few hours. Great guitar instructor with experience in guitar methods , music theory, tecnique, chording , picking etc from beginners to expert. Stage and recording experience and fun to learn from. Can’t loose! Give him a call or email and start you guitar adventure! It is clear that michael has a passion for playing guitar and puts the time and effort in to assuring his students achieve the goal they desire. He has been a pleasure to work with. Michael is knowledgeable in his field and takes the time to invest in the interest(s) of each student he teaches! He is passionate, professional, and a musician who teaches from experience. I am proud to call Michael a colleague and friend! I can teach you all the funnest bass riffs and show you how to make your own bass lines and jam in several styles. I can also show you how to use your ear so you can jam along to whatever music you hear! I have been playing bass guitar professionally for seven years now, which includes countless shows in the Los Angeles area. I've performed across all genres including: rock, blues, electronic, jazz, classical,metal, RnB, and hip-hop. Brian is both a bass player and an audio engineer. He graduated from the University of Miami's Frost School of Music with a Music Engineering degree in 2016, and moved to Los Angeles to pursue music with his band. His band is signed to an independent label based in the heart of Los Angeles. He is fluent in all bass guitar techniques, Pro Tools, Audio Engineering, and Ableton Live. His passion for the arts, fun loving attitude, and custom lesson plans make him the perfect teacher for someone trying to hone their skills. My first lesson with Brian was really good, much better than I expected! I feel like I’m finally getting a handle on Ableton. I’m looking forward to the remaining lessons. Brian is super responsive, knowledgeable and relaxed. My son had a terrific experience at his first Ableton lesson. Brian is terrific. It’s great working with Brian! I am a self-taught bassist and have been playing now for 6 years. I now record all of my own bass-lines for tracks I produce and have played bass for 2 bands whom have played a small handful of live shows in Pasadena, CA. I am professionally trained in all aspects of music. My goal for my students is to help them master the basics, as well as use their own creativity to grow as a musician. Everyone has a different goal in sight, and I am here to coach them while they follow their own path in music. Are you ready for a chance to grow as a musician? Well, you are in the right place. I have more than 14 years of playing and performing under my belt. I will make a fun class every week, where we will practice a song, work on fundamentals, and find your unique creativity and exploit it so you can add your own flavor into your playing. Let's think of me more as a coach than a teacher. Meaning I am here to guide you instead of me telling you what to do. Sign up for classes today, and I promise to guide you on your path to becoming a great musician! Can't find a teacher in Anaheim, CA? ike only now through her guidance am I really starting to understand my instrument. She has a great way of layering knowledge to help it stick, and is very patient. I highly recommend her." or finding the best way to help his students truly learn. If you want a teacher whose number one priority is ensuring your growth as a musician, this is it!" Los Angeles, CA teacher: Brian G.
"Great Teacher. Took the time to explain everything. Looking forward to the next leasson." "Great first lesson! Moa is very cool and patient! Can't wait for the next one." Los Angeles, CA teacher: Moa M.
"He is very patient and encouraging. He will also inspire your heart by letting you learn the song you like." away. I would definitely recommend him!" Los Angeles, CA teacher: Kellen H.
anyone who wants to learn how to play some good music." rong command of these software platforms. I learned a lot about bass from Evren, from jazz to funk and rock. He helped me improve my playing tremendously. I recommend him to everyone!" Los Angeles, CA teacher: Evren T.